The Rain Bird Factory Trained Program is exclusive to Rain Bird products. The high-quality hands-on training will teach you best practices for installing, operating and providing maintenance for Rain Bird systems. After attending a Rain Bird Factory Trained course and passing a written exam you will earn a Rain Bird Factory Trained designation. You will receive a certificate and designation mark for that specific course. You can use the designation mark to promote yourself as Rain Bird Factory Trained on your website, bid letters and other marketing material. Rain Bird Factory Trained™ Your Competitive Advantage When customers are demanding more from their irrigation systems, you need every advantage! How does being Factory Trained help you? How does being Factory Trained help your customers? Why should I become a Rain Bird Factory Trained Professional? Becoming a Rain Bird Factory Trained Professional means that you will have completed the highest level of professional training on the installation, operation and maintenance and troubleshooting practices for Rain Bird products and systems. Installation best practices for Rain Bird Central Control systems so that you can prolong system life, receive fewer service callbacks due to installation problems and achieve the most water-efficient system design for your customers. The powerful program features of Rain Bird Central Control such as Flo-Manager™ and Flo-Watch™, ET-based scheduling and remote control using the FREEDOM remote control system, so that you can manage your customer’s system in the most efficient manner possible, while effectively managing their water budgets. Maintaining, troubleshooting and repairing system discrepancies in addition to the removal and replacement of hardwarecomponents. How do I earn a Rain Bird Factory Trained designation? You can earn Rain Bird Factory Trained designations by completing the qualifying coursework and passing a written exam. Factory Trained courses are clearly identified. Agree to the safety statement and the code of ethics. Attend the course and complete all of the required hands-on and practical in-class activities. At the end of the course the instructor will administer a written exam. You must score a 70% or higher in order to earn your designation. How will a Rain Bird Factory Trained designation benefit me? By using the Factory Trained designation mark in your marketing and advertising materials, you are leveraging the #1 brand in irrigation, Rain Bird. You can use the Rain Bird Factory Trained designation mark on your website, marketing materials and bid proposals. What will I get when I become Rain Bird Factory Trained Professional? In addition to receiving the highest quality training on Rain Bird products and installation, operation and maintenance best practices, you will also receive the following benefits. 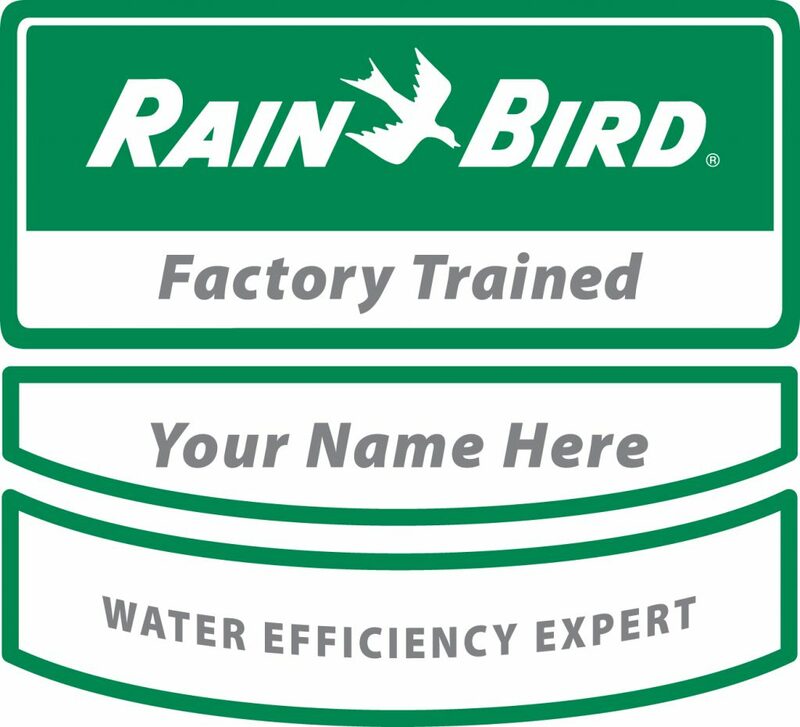 You will receive a personalized certificate demonstrating that you have earned a Rain Bird Factory Trained designation. You will receive a Factory Trained designation mark that you use to promote yourself as Rain Bird Factor Trained. Is the Rain Bird Factory Trained Program only for irrigation contractors? Designers who have to balance the requirements of the project with the capabilities of the right product and/or irrigation system. Specifiers who are tasked with identifying and “putting together” all the necessary components required to make the product and/or system perform as required by the customer. Service Technicians whose assignments are the upkeep, maintenance, troubleshooting and repair of the product and/or irrigation system. Water Managers who are responsible for the day-to-day operation and reporting documentation of the product and/or irrigation system.